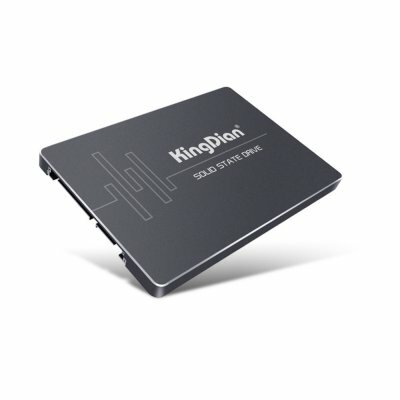 Successfully Added KingDian S280-120GB Solid State Drive - Supports ATA And SATA, Low Power Consumption, 4 Channel, SATA 3, PIO, DMA, UDMA to your Shopping Cart. Upgrade your PC’s performance and storage capabilities with the KingDian S280-120GB Solid State Drive. It measures 2.5-Inches in size and supports all major Windows systems as well as DOS and Linux. The SSD fully consist of semiconductor devices that use NAND flash memory. This provides you with high reliability and a high performance in terms of media storage. In total, it offers you an impressive 120GB storage space. This is enough to keep all your media, games, and files safely stored away for years to come. This powerful SSD features a SATA 3 interface and is fully compliant with SATA revision 3.1. It furthermore is compatible with SATA 1.5/3.0. It treats you to a read performance up to 559.7MB/s and a write performance up to 380.5MB/s. This means that it will deliver you a powerful and fast performance without you ever needing to worry about experiencing any delay while digging through previously stored data. With 10-year data retention, this SSD is capable of storing plenty of your most valuable data. With this disk at your side, you’ll be able to enjoy better PC and laptop solutions for years to come. It is guaranteed to enhance your user experience with its high performance, reduced latency, and low power consumption. The KingDian S280-120GB Solid State Drive comes with a 12 months warranty, brought to you by the leader in electronic devices as well as wholesale PC gadgets..